Ford announced widespread availability of their Ford SYNC technology in vehicles in 2010 and beyond. The innovation puts contact management, multimedia, and apps on the dashboard of vehicles. Voice-activated commands ensure your hands aren’t distracted while driving. Included in the Ford SYNC suite of software is a phone book. At the moment, it’s not clear if other productivity apps like calendar, tasks and notes will be included. However, Ford is giving access to their API to 3rd-party developers to create custom apps in vehicles that have Ford SYNC. For example, CompanionLink could use the APIs to build a business-like suite of office productivity tools that includes custom calendar, tasks, and notes modules. 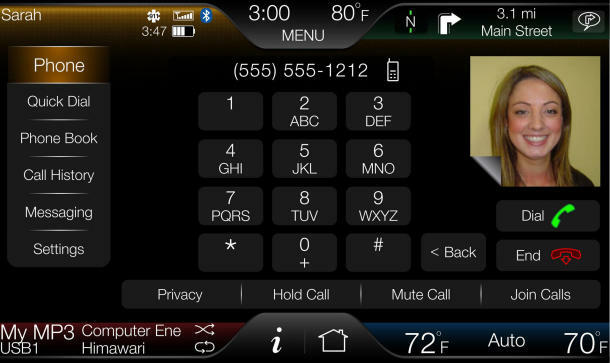 Using the voice-activated features of Ford SYNC, users could then dictate calendar events, tasks and notes. Another neat feature of Ford SYNC is its built in Wi-Fi and hot-spot capabilities. Passengers can use Wi-Fi to access the internet when the car is parked. Using this built-in Wi-Fi capability, CompanionLink will be able to synchronize data between office PC software (like Microsoft Outlook, Lotus Notes, etc.) and the in-vehicle dashboard. For example, if a new contact or calendar event is created on the office PC, CompanionLink could transfer that data to the phone book or calendar app in the vehicle. And vice-versa. This entry was posted in News and tagged apps for cars, apps for vehicles, car, ford, ford sync, ford sync apps, vehicles by Rushang. Bookmark the permalink.